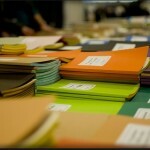 Intensive Italian Courses in Rome - 4 weeks (60hrs) from May 6th - 5% OFF if you enrol by April 26th! Promo for Au-Pairs, Students, Religious, Diplomats, FAO/IFAD/WFP staff: 299€+45€ - FREE TRIAL LESSONS available! Do you want to be a qualified English Teacher worldwide? It's time to train yourself with a Trinity TEFL course in Rome! Click here! Italian lessons for Kids at only 159€ per month! Online Italian lessons through Skype from 20€ p/h! (HAPPY) HOUR LANGUAGE EXCHANGE! Every Wednesday at 7.30 pm! 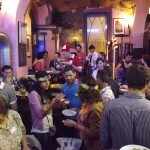 1h Italian lesson + Aperitif + Language Exchange with local people: 12€! Learn Italian in Rome, discover the Italian culture and meet new friends! Koiné is an Italian language school in Rome that offers Italian language courses for foreigners at all levels: courses in group, one-to-one lessons, corporate courses, online lessons, courses for kids and Italian cooking lessons. We also provide intensive social programs including multicultural aperitifs, tours of the city and other cultural events to learn Italian with fun! Over the past years Koine has hosted students of various nationalities from all over the world, our lessons are based on dynamic teaching methods and a stimulating language programme that incorporates student’s interests and various aspects of italian culture and art. 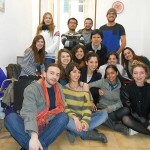 The Italian language school Koiné is located in one of the most vibrant and beautiful areas in the center of Rome. 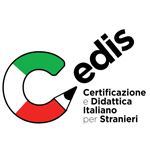 The course DITALS is aimed at aspiring teachers of Italian as a second language and Italian as a Foreign Language. 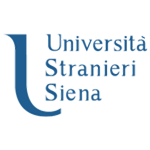 We offer Italian language courses at all levels with native teachers and dynamic lessons. Let's check your Italian language level! Discover our promotions and book now!